Superb quality, A-Grade, translucent Rose Quartz pendulum, set with a 925 sterling silver collar and finished with a beautiful, ornate 925 sterling silver heart topper with Rose Quartz bead. The belcher chain is also 925 sterling silver, and it's set with two, genuine, freshwater seed pearls (combined with figaro chain), making this a top quality pendulum. 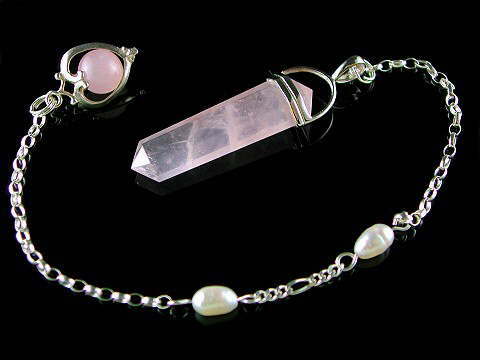 The Rose Quartz pendulum is premium, A-Grade quality with some beautiful, soft, veil-like inclusions, not found in the cheaper, opaque Rose Quartz. This is THE stone of self- and unconditional love. Most of us know about the properties of Rose Quartz. It is often one of the first crystals we work with or come into contact with. Commercially it is almost always marketed as a Love Stone, which indeed it is, and has been regarded so for thousands of years with its beautiful, sweet energy, but it there is also a deeper side and purpose to this much loved, but often overlooked pink stone. If you want to read more about Rose Quartz and its crystal 'mission', visit the A to Z section of this web site and look up its meaning. Rose Quartz is also excellent for any 3th Ray (Pink Flame) work, as this crystal resonates with Archangel Chamuel, the archangel of love and Master of the 3rd Ray. Pearls are often given as a token of love and traditionally they are given on the 3rd wedding anniversary. In folklore pearls were thought to be tears of the Gods, so when given as a gift, they were said to ward against unhappiness and would promote marital or relationship bliss. Other tales say that they were the tears of mermaids, containing magical properties which would benefit the wearer. Their origins make them perfect for any of the astrological 'water' signs; Cancer, Scorpio and Pisces.